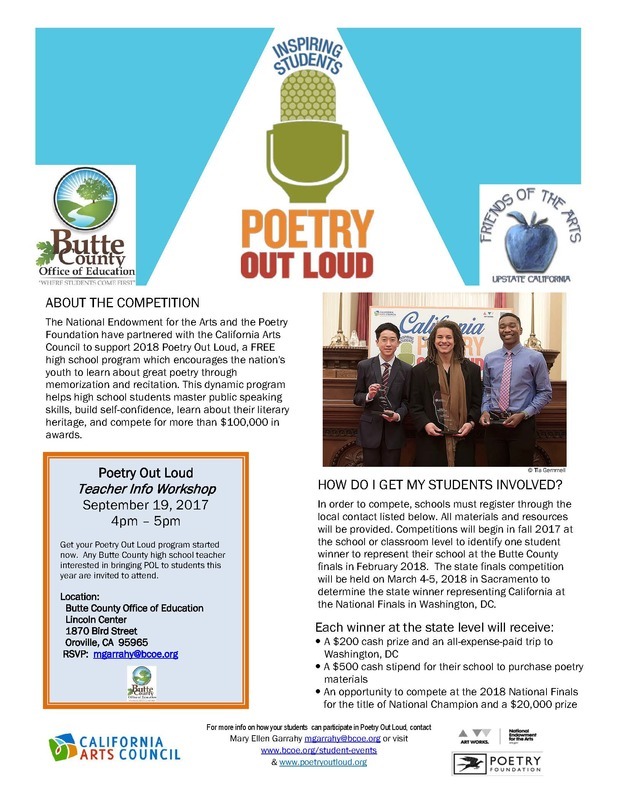 The National Endowment for the Arts and the Poetry Foundation have partnered with the California Arts Council to support 2018 Poetry Out Loud, a FREE high school program which encourages the nation's youth to learn about great poetry through memorization and recitation. This dynamic program helps high school students master public speaking skills, build self-confidence, learn about their literary heritage, and compete for more than $100,000 in awards. In order to compete, schools must register through the local contact listed below. All materials and resources will be provided. Competitions will begin in fall 2017 at the school or classroom level to identify one student winner to represent their school at the Butte County finals in February 2018. The state finals competition will be held on March 4-5, 2018 in Sacramento to determine the state winner representing California at the National Finals in Washington, DC. Get your Poetry Out Loud program started now. Any Butte County high school teacher interested in bringing POL to students this year are invited to attend.